December « 2016 « Write, or Else! Until then, I’m finishing my marking and reports for my workplace, and looking into ways to earn extra coin during the break between semesters. I’m driving towards completion of the draft of the novel I’m working on as well. On top of all that, I’m also dealing with some personal matters and I’m engaged in some counselling sessions. A bit of a mess, aye, but I will get through it and I will return. Keep dreaming, keep reading, and of course, keep writing! Two books from Inkshares reached my radar this week. Why Inkshares you ask? It might just be the place to launch my own book in the near future! 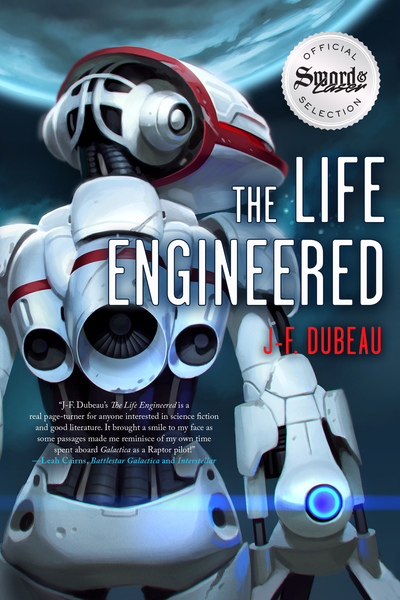 I loved the sample of The Life Engineered so much that I went ahead and nabbed the ebook. I would have got the paperback, but alas, international shipping fees would have tripled the price. The story opens a vast, detailed universe with A.I. characters that are as compelling as humans. The prose moves quickly, making it a fun read and an excellent introduction to Dubeau’s writing. The story follows the Capeks, a race of sentient robots left behind by humanity (humans are nowhere to be found). The robots were given the tools to build a better society than humans could ever manage, but once an important Capek is murdered, everything changes. I’m still reading this now, but it won’t take long to finish. It’s only 150 pages long, and $0.99 as an ebook – so go check it out! The sample for Witherfist is really, really cool. I’ve been enjoying the exploration of a fantasy world not centered on European culture and mythology. Instead, Witherfist draws on Asian characters and presents a world where the true name of a person or being allows you to hold power over it. The book follows multiple characters, but most interesting for me is the character of Irusai. She’s a warlord (warlady?) who gained power by tattooing the name of a dark spirit on her arm. She gained its power and skill – she can drain the life force of her enemies through her cursed touch. Now she wants to redeem herself and get rid of this evil spirit, so that she can be with her husband and daughter. Just in the preview, this story really drew me in with its worldbuilding and interesting characters. I think this is a project worth funding. All right, just what are you reading this week?